Credit: Yang, Garg & Parkin. A quasiparticle is a disturbance or excitation (e.g. spin waves, bubbles, etc.) that behaves as a particle and could therefore be regarded as one. Long-range interactions between quasiparticles can give rise to a 'drag,' which affects the fundamental properties of many systems in condensed matter physics. This drag generally involves an exchange of linear momentum between quasiparticles, which strongly influences their transport properties. Researchers at IBM and the Max Planck Institute have carried out a study investigating this drag and chirality oscillations in synthetic antiferromagnets. 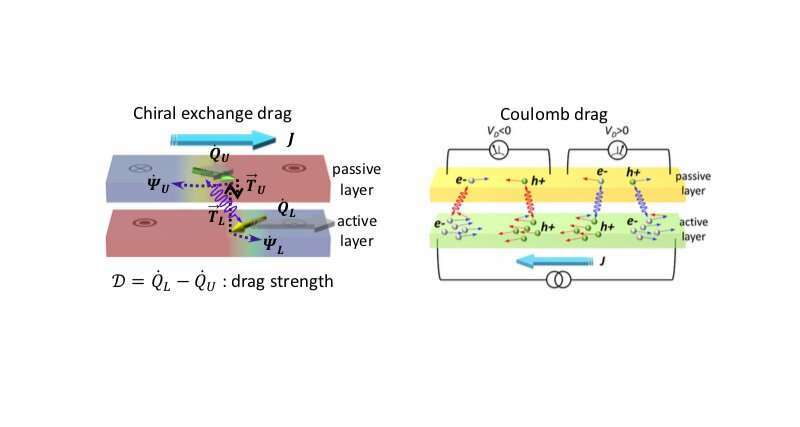 In their paper, which was recently published in Nature Physics, they defined a new type of drag that involves the exchange of angular momentum between two current-driven magnetic domain walls. "In recent years, I have worked on the interplay of spin current with chiral magnetic domain wall whose chirality is set by Dzyaloshinskii-Moriya interaction at interface," See-Hun Yang, an IBM researcher who carried out the study, told Phys.org. In 2013, Yang and his colleagues showed that chiral domain walls can be efficiently moved by a relativistic spin-orbit interaction induced spin current, referred to as spin-orbit torque. Around the same time, this observation was also reported by a group of researchers at MIT. A few years later, Yang and his colleagues observed that coupled chiral domain walls can move at much higher velocity (~ 1 km/s) by current, due to a powerful exchange coupling torque when they are antiferromagnetically coupled. Yang developed a model that could help to better understand these observations and also discovered a new powerful torque called exchange coupling torque. "During the data fitting with my model, I spotted a strange anomaly phase in a certain parameter space in domain wall velocity versus applied longitudinal field curves that shows a high asymmetry," Yang explained. "I observed that a coupled domain wall gets dramatically slowed down at negative fields when the exchange coupling is relatively weak. For instance, my model showed that coupled domain velocity collapses from 500 m/s down to zero by application of merely -50 mT field." Yang found that the dramatic reduction in velocity observed in his research was due to oscillation of coupled domain walls displacement. Most interestingly, he learned that domain wall magnetizations oscillate/precess in a way that is synchronously correlated with domain walls displacement. "To observe this interesting novel phase, we started a new experiment by preparing devices formed from weakly coupled synthetic antiferromagnetic (SAF) films, which could be achieved by growing thinner Cobalt layers sandwiching Ruthenium spacer in SAF," Yang said. "Note that Ruderman-Kittel-Kasuya-Yosida (RKKY) interaction induces exchange coupling between Cobalt layers across Ruthenium spacer layer." The strength and sign of RKKY interactions are sensitively dependent on the thickness of a Ruthenium layer. Since RKKY interactions are only sensitive to interfaces, given a particular Ruthenium layer thickness, the exchange coupling strength can be tuned further by thinning down the Cobalt layer below one monolayer. "In our experiment, we luckily and immediately reproduced the highly asymmetric domain wall velocity-longitudinal field curve and dramatic collapse of domain wall velocity predicted by my model, which I was very excited about at the time," Yang said. "However, it took more than a year for me to fully understand the physical mechanism of this strange phase." In an attempt to better understand his prior observations, Yang spent a long time looking into his model and rewriting coupled equations of motion in several different ways. He finally discovered that the strange dynamic phase he had observed was related to a kind of drag called chiral exchange drag (CED). "When a current flows into two coupled sub-layers, different spin-orbit torques are exerted on chiral domain walls since the environment for each domain wall is not identical," Yang explained. "Consequently, one chiral domain wall moves faster than the other. However, since their positions are tightly bound to each other, a faster domain wall "drags" a slower one. This means that the coupled domain walls move at the intermediate velocity, that is, average velocity weighted by their magnetizations." This process does not immediately give rise to the strange phase observed by Yang, since at this stage the coupled domain walls still travel at a steady and reasonable velocity. However, as the drag increases and exceeds a threshold value, the structure of the chiral domain walls becomes unstable. In his research, Yang also found that the applied longitudinal field acts as a knob, which can be used to tune the drag strength. "This unstable domain wall structure corresponds to the strange dynamic phase, and I dubbed it 'chiral exchange drag anomaly,'" Yang said. "I learned that in this phase the magnetization of slower chiral domain wall precesses, that is, the chirality oscillates. Essentially, in this chiral exchange drag anomaly phase, the kinetic energy of a large drag is converted to another internal DOF of angular momentum, that is, azimuthal rotation of domain wall magnetization, thus leading to a dramatic drop of average displacement of domain walls." While he was developing his model, Yang also introduced two new concepts: quasi-domain walls and composite domains. Quasi-domain walls are fictitious domain walls constrained to sublayers in SAF wire, as if their positions are decoupled from each other and they move independently. Their magnetizations are dressed with exchange coupling interaction, therefore, quasi-domain walls are similar to quasi-particles. Composite domain walls, on the other hand, correspond to the actual coupled domain walls that are composed of position-locked quasi-domain walls. "When I first described these concepts, I did not realize how important my findings were and what impact they would have in broad physics," Yang said. "Some time later, two further insights about the important physical meaning of "drag" occurred me when I was traveling. The first one happened when I was on a train reading a review article about Coulomb drag." Around the time he made this first realization, Yang had just discovered that while CED and Coulomb drag share many similarities, they also had substantial differences. For instance, in contrast with Coulomb drag, in CED chirality plays a key role, the positions of coupled chiral domain walls are bound to one another other, and the chiral domain walls have another internal DOF. "I got a second insight when I was reading a chapter about Dirac equations from a quantum field theory textbook in a hotel room during a vacation," Yang said. "At the time, I was intrigued by surprising analogues between my CED and Dirac fermions. For example, chirality of coupled domain walls is constant in the steady state of CED. This is similar to massless Dirac ferimons that can be described by Weyl equations. In this case, chirality is a good quantum number and constant. On the other hand, as the Dirac fermions become massive, chirality is no longer an eigenstate such that the chirality oscillates with oscillating frequency that is linearly proportional to the mass. Similarly, in CED anomaly phase the chirality of slower domain wall oscillates with oscillating frequency that is almost linearly proportional to the net magnetization." The new research carried out by Yang and his colleagues is based on his previous work and observations. In this study, they used magneto-optic Kerr microscopy to measure the current-driven chiral magnetic domain walls, which allowed them to spot their position. Before they applied current pulses, they took a Kerr image of wires patterned by weakly coupled SAF film. "After applying a sequence of a few nanosecond long pulses to the wire, another Kerr image was taken," Yang explained. "The domain wall velocity could then be calculated from the domain wall displacement distance divided by current pulse length." The researchers used a Kerr microscope equipped with electromagnets. This allowed them to apply in-plane and out-of-plane magnetic fields during the procedure described above. Yang and his colleagues successfully defined a new form of drag, CED, which is derived from coupled chiral magnetic domain walls that are associated with an angular momentum transfer torque. In addition, they observed that the strength of this drag can be tuned by leveraging the chiral nature of domain walls. Finally, the researchers observed a new domain wall dynamic phase, the CED anomaly phase outlined above, which takes place when the drag exceeds a threshold value. Interestingly, both CED and CED anomaly present striking similarities with other drag phenomena in condensed matter physics, such as Coulomb drag, as well as with Dirac fermions in high energy physics. 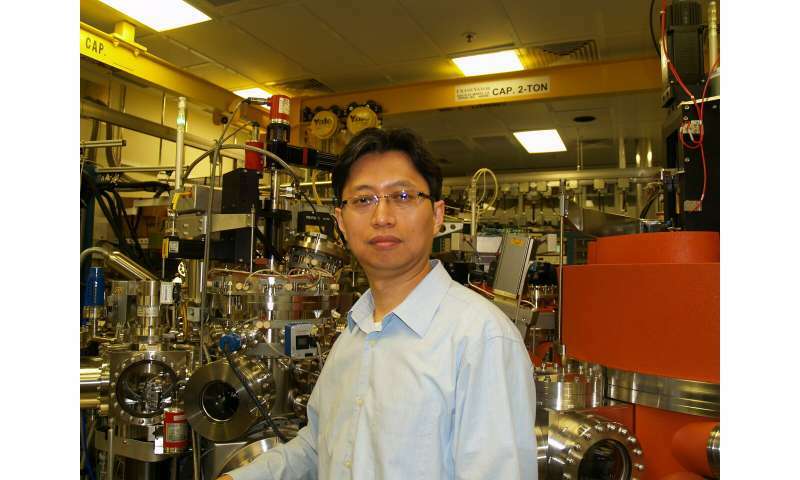 "We are witnessing the emergence of an exciting field, Chiral Spintronics, the marriage of spintronics to chirality, which has attracted enormous attention in magnetic and condensed matter physics communities," Yang said. "I think that CED and CED anomaly are an outstanding example of and a significant contribution to Chiral Spintronics. I am now planning to tackle other chiral systems such as chiral ferrimagnets and antiferromagnets and their interplay with moving spins."